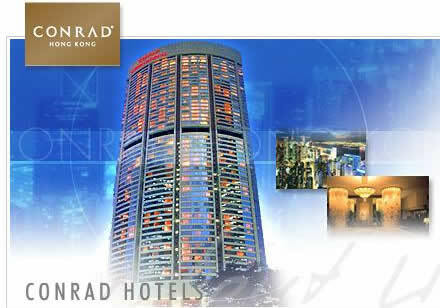 Recognized as one of the world's finest business hotels, Conrad® Hong Kong combines luxury with a superb location. Soaring 61 floors above Pacific Place, an upscale retail and entertainment complex, the hotel is adjacent to the Central Business District. It offers easy access to all major transportation, including Mass Transit Railway, Starr Ferry, bus and tram services. Located on floors 40 through 61, each of the 513 guest rooms are more than 460 square feet in area, consistently the most spacious in Hong Kong. Suites range in size from 861 to 2,511 square feet. Each room offers breathtaking views of Victoria Peak and Hong Kong Harbour. Rooms feature remote-control colour television with 27 channels, including news, sports, entertainment and movies. The luxurious fully marble bathrooms feature double sinks, full-size bath and separate shower. All rooms are equipped with in-room facsimile machines with private numbers, dataport with Internet access, electronic safes, bathrobes, umbrellas, slippers and coffee-and-tea making facilities. The Executive Floors on levels 57 through 61 offer private check-in, butler service and complimentary full breakfast on the 59th floor executive lounge, which has a private meeting room for executive floor guests. Conrad Hong Kong also has a 24-hour full service business center, state-of-the-art health club, heated outdoor pool and whirlpool. A US $4.2 million renovation of the Ballroom and Lobby provides Hong Kong's most elegant venue for corporate meetings and events. Executive floors are only accessed by room keys. The hotel's business center also provides notebook rental for guests travelling without software, along with a selection of mobile phones.